After I saw the GWX update showing up on my PCs, I immediately opened up Visual Studio and got to work on this. While any of us can just open up Control Panel (while it lasts) and uninstall the update, how many regular users can? So I created a GUI shell for the WUSA command to make it easy for anyone to uninstall this piece of adware. If anyone has any issues, let me know. I will try to fix it as soon as possible. EDIT: Version 2.0 is here! EDIT 2: Version 3.0 is here! Special thanks to Glenn9999, NoelC, dencorso, and jaclaz for helping me with these updates. This happens on your 32-bit version. As for this, look up DisableWow64Redirection and RevertWow64Redirection. (Edit: I got reminded by reading rn10950's new code that these are wrong. These are the aliases I used. The real functions of concern are Wow64DisableWow64FsRedirection and Wow64RevertWow64FsRedirection. While the OP figured out the right functions, I thought I'd add this for anyone who might search looking for this answer here) You will need to call those as you did IsWow64Process and need to use them anytime you have a 32-bit process that needs to address configuration assets of a 64-bit system to work properly. Be sure to call the Revert function very soon after you have to Disable. You can force that through your application manifest to elevate itself to Administrator privileges (with the accompanying "do you wish this program to change things?" dialog box). Interesting idea, though. I don't know how much demand you're getting, but it'd be half-interesting to make this app more generic if there is some interest. Resolved the first error myself (deinstalled/reinstalled all VC++ runtimes). Went ahead and ran your app and received "This application needs Windows 7 or Windows 8.1" unconditionally. Minor version may be 2 as well in order for your app to be valid. The VC++ error workaround is included in the readme files in the zip file with the binaries in it, as well as the runtime installers. The GWX update, as far as I know, doesn't affect Windows 8.0, only 8.1, which is NT 6.3 not NT 6.2. If you have the GWX installer in Windows 8.0, please let me know. Mine (Win 8.1 fully patched) returns 2 as a minor version (I know, I checked it myself). As for your MessageBox problem, it happening seems to indicate that some of your app messages aren't being processed. Most Google responses point to WM_PAINT as the culprit, but I don't see a main message pump loop and don't have VC++ to play with here, so hopefully that gives a direction to look. It's something I've already done in the past for a while (using compatibility manifest entries), but it looks like you need the app compatibility section of the manifest now in order to be fully Win 8.1 supporting. My app check with that manifest in force produces a minor version of 3. Edit: And here's what GetVersionEx is deprecated in favor of. Looks pretty easy to implement. Edit again: I updated the manifest above for Windows 10 compatibility. What do you mean by "similarly broken"? It returns the system version of whatever the latest version your application is manifested for. The change is by design (however twisted the thinking). You're no longer supposed to care what version of Windows you're running on. Windows is in control, not you. Didn't you get the memo? You'd think you could craft an iterative function based on IsWindowsVersionOrGreater and I've tried it. At the moment it reports version 6.3 service pack 0 on Windows 10 build 10130 with an application built in Visual Studio 2013 and manifested for Windows 8.1. That reminds me to try a VS2015 build. Edit: Tried it. The iterative IsWindowsVersionOrGreater routine just appears to return the highest version number the application is manifested for. I meant in terms of what it returns. On my system, GetVersionEx returns 6.2 in a program with no manifest, which is false since it's a Windows 8.1 install. This also happens to describe rn10950's program(s) as a OS version check exists using this function, so they are effectively broken. But you basically explained why. In the future, versioning is basically meaningless, so you have to resort to other methods. In that sense, the application manifest is what determines the version returned, and what is put there determines what kind of app compatibility measures the OS undertakes. So the application manifest (as I quoted it) becomes paramount much more than the OS version. Hence, rn10950's primary corrective is to add that compatibility manifest as I quoted. Though it might be much more preferable from an OS standpoint for him/her to use IsWindowsVersionOrGreater than use GetVersionEx as was done. Of course, the problem with the application manifest is that I forsee having to do a release of my programs (BatchPatcher, namely, as it's the only thing I've done where OS ver return is important) every time Microsoft releases an OS. I'd like to be able to read the real version number for logging purposes (e.g., someone sends in a log from software where they've seen a failure, and we can tell what OS they were running it on - that kind of things). I believe I'll be adding something that reads the registry to do this. I would have used IsWindowsVersionOrGreater but the issue is that the update is only present on Windows 7 or Windows 8.1, not Windows 8 RTM. Like NoelC said, versioning is going away, but there is still limited use cases where it is required, like this. I still don't know what MS was thinking when they made Windows 8.1 NT 6.3 while still reporting NT 6.2 to applications. Reading the file versions of NTOSKRNL.EXE, NTDLL.DLL and SMSS.EXE should be the most reliable way for determining the true windows version, and ought to be reliable, isn't it so? Like NoelC said, versioning is going away, but there is still limited use cases where it is required, like this. I still don't know what MS was thinking when they made Windows 8.1 NT 6.3 while still reporting NT 6.2 to applications. FWIW, it looks like the versioning will still happen with applications, but through that manifest and not entirely through code. Actually, it's returning 6.3 on mine, as opposed to 6.2 on GetVersionEx. 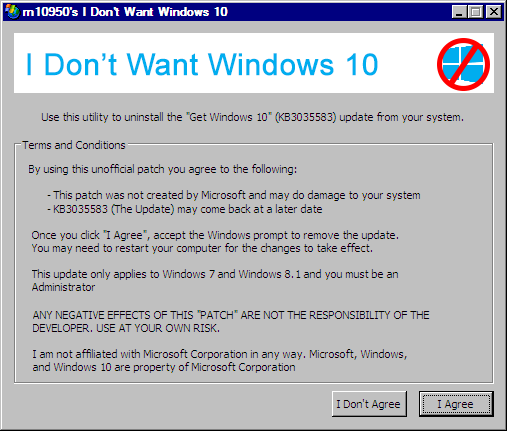 I imagine they'll bump that up to 10.0 when Win 10 goes to RTM, but only for applications with a Win 10 manifest. And I wouldn't put it past them to change the GUID for the "Compatible with Win 10" line in the manifests either. The point being the version into APIs aren't what you need if you want to know the real version. Dencorso, you're probably right - especially since it looks like there will never again be a way to hide updates that deliver new versions of those components. Obviously it'll have to do some heuristics when unexpected versions are found, but it should be reliable enough. Incidentally, a similar method, but based solely (AFAIK) on the version of kernel32.dll, has been the way Kan Yabumoto settled on for xxcopy to know which windows it's running on, for quite a long time already... The loss of a sane versioning mechanism is another great accomplishment of the more recent versions of windows, so MS must be quite proud of it!